For centuries, the Walls of Jerusalem stood between the city’s inhabitants and hordes of invaders seeking to conquer the ancient metropolis city make off with its treasures. Israel’s King David conquered it in ancient times and his son Solomon built the First Temple and extended the city’s walls. Those walls held firm until the Babylonians laid siege to Jerusalem in 587 BC and ultimately leveled the entire city. Since then the walls have been rebuilt, destroyed and rebuilt many times over until the Ottoman Empire’s Sultan Suleiman the Magnificent ordered them rebuilt once again. The four-year project was finuished in 1541 complete with 34 watch towers and 8 gates. Now those walls rise once again in this epic silver medal struck in a troy ounce of gleaming 99.9% silver. Issued by the Holy Land Mint in Israel, this medal is the third installment in the popular “Views of Jerusalem” series. It’s a fantastic program that lets you take a breathtaking tour of Jerusalem through a series of silver bullion releases. Just 3,600 of these Brilliant Uncirculated (BU) medals will ever be minted, however, so if you want to secure the Walls of Jerusalem, you had better do it now before it’s too late! According to Jewish tradition, seven of the eight gates located within the Walls of Jerusalem are to remain open and serve as passageways into and out of the city. The eighth gate – known as the Golden Gate – is blocked and will open only upon the arrival of the Messiah, at which time the dead will be resurrected. Today, the Walls of Jerusalem are listed on the UNESCO World Heritage Site list and are visited by millions of tourists and religious pilgrims each year. If you can’t make the trek, do the next best thing – click one of these silver medals to your cart! 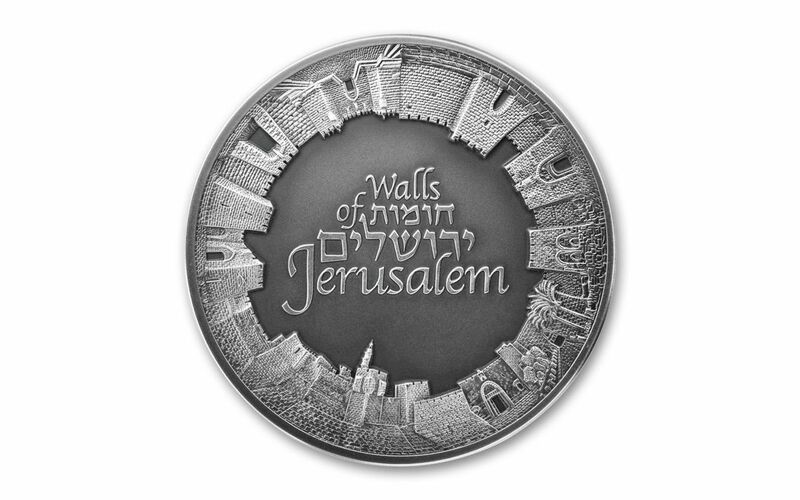 STUNNING DESIGN – The detail of the 2018 Israel Walls of Jerusalem Silver Medal creates a circular wall surrounding the stylized inscription that reads “Walls of Jerusalem” in both English and Hebrew. 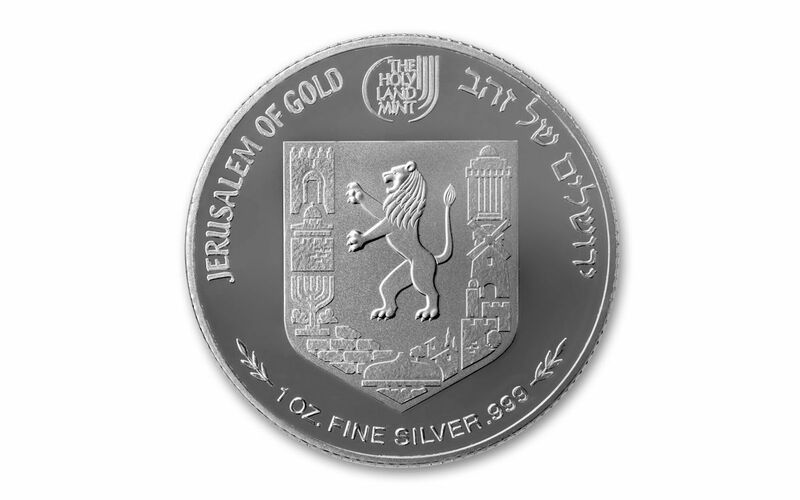 The reverse features the Lion of Jerusalem and prominent buildings of the city within the outline of a coat of arms. STRUCK IN HIGHLY-PURE SILVER – These 2018 Israel Walls of Jerusalem Silver Medals are struck in a full ounce of 99.9% silver. GLEAMING BRILLIANT UNCIRCULATED CONDITION – Your 2018 Israel Walls of Jerusalem One-Ounce Silver Medal comes in gleaming Brilliant Uncirculated (BU) condition, as sharp, fresh and crisp as the day it left the mint. LOW WORLDWIDE EDITION LIMIT – The Holy Land Mint in Israel set the maximum worldwide edition limit for the 2018 Israel Walls of Jerusalem One-Ounce Silver Medal at only 3,600. With so few of these spectacular 2018 Israel Walls of Jerusalem One-Ounce Silver Medals available, it may take a miracle to acquire one at this price in the future if you miss out now!